Control is merely an illusion in the latest trailer for Mr. 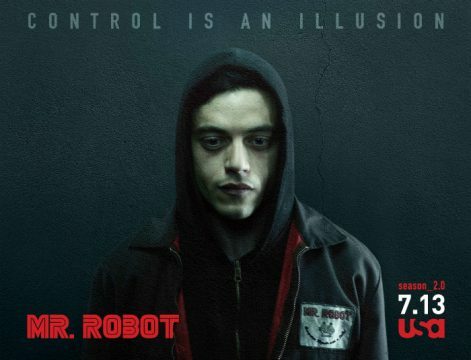 Robot season 2, heralding the return of Rami Malek’s wildly erratic protagonist Elliot and the hacking group that now holds all the power chips over the top one percent. That’s fsociety, the underground crew of impassioned anarchists headed up by Christian Slater’s title character. In light of Mr. Robot‘s breathless opening season, the chess pieces are scattered across the board, and we can’t wait to see how things unravel from here. Peppered throughout that season were moments of madness for our own “hero” Elliot Alderson, and it’ll be fascinating to see how series creator Sam Esmail toys with our expectations through the lens of a capricious protagonist. Tormented and largely out on his own, particularly now that Portia Doubleday’s Angela continues to be pulled into the clutches of one Phillip Price, Elliot is in for a rough ride when it comes to Mr. Robot season 2, which ought to serve up plenty of dramatic material for Malek to chew on in a few weeks’ time. Mr. Robot season 2 will be with us when USA Network’s mesmerizing hit series returns on July 13. Portia Doubleday, Carly Chaikin, Joey Bada$$, Chris Conroy, Grace Gummer and Craig Robinson are among the cast for the show’s sophomore season.